We are engaged in offering a wide range of Brick Bat Coba Waterproofing Service to our valued patrons. 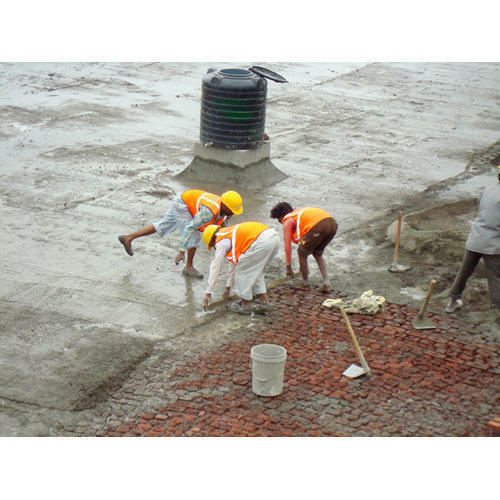 In this type of waterproofing on exposed RCC slab, a neat slurry mix of cement and waterproofing compound is spread evenly with brickbats. Apart from this, our professionals interact with clients and understand their needs to provide this waterproofing service accordingly. Commenced in the year 2012, Perfect Waterproofing And Coating Services has enlisted the name of the company among the leading firms for offering the commendable array of Waterproofing and Coating Service. Since our starting, we are offering highly effective Waterproofing Service, Painting Services, and Coating Service.The services offered by us are in conformation with industry laid standards. Also, our services are rendered using high-grade resources and latest technology. Over the years, we have been able to attain a foremost place in the market due to the working spirit and dedication of our personnel. Each member is selected after positively passing some stern recruitment tests that are set to examine their creativity and trade acumen. Moreover, our team of expert’s works with completes dedication so that we can achieve the maximum level of customer satisfaction. In addition to this, our professional team is expert in handling the latest techniques as per patron’s requirements.